URGENT UPDATE: The Good News: Will Sansom of 3rd Ward has confirmed with brooklyn-artisan.net that people who join as new Basic Plan (usually $99 a year) members today through midnight, Monday night, October 15, can get a special rate of 50% off. Mention Brooklyn Artisan when you inquire. The Not-so-good News: Thursday night’s session on using Kickstarter to raise funds for your business project was so packed that even people who’d registered in advance, like us, (but arrived two minutes late) were unable to squeeze in even to stand among the spillover crowd in the back. Craning our necks to peer around the corner, we could see the edge of a chart on a slide, couldn’t hear a bit better, and did become an annoyance to the people we were leaning on to get a peek. 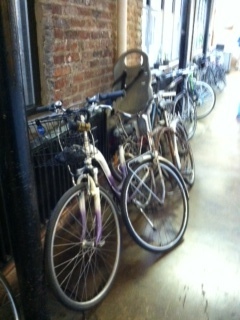 Member transport: Bikes locked to the radiator along a 40-foot hallway. It’s a story of 2’s. 3rd Ward recently took over Floor Two of the warehouse building, doubling their space overall (to about 30,000 square feet). Staff? Around 20 people. Courses offered? About 200. Membership? 2000. Members who work there fulltime? 200. How long has Will himself worked there? 2 years. Doing what? A lot of construction such as putting down plywood patches on the strip oak floor upstairs. 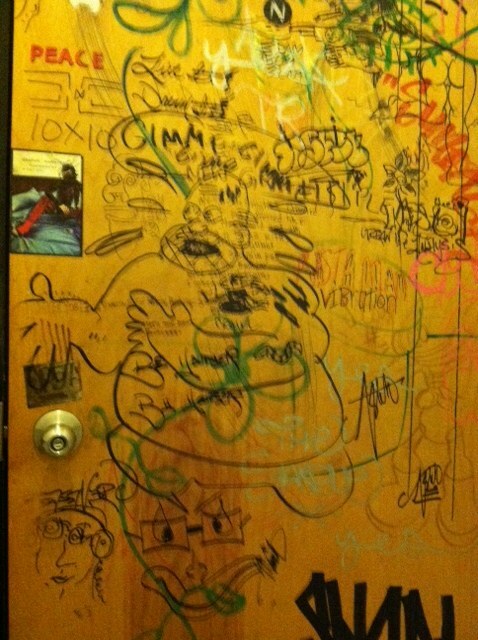 A somewhat, er, collegiate aesthetic on a bathroom door. So all of the old wood strip floors upstairs are rough and patchy, yes, but still kinder underfoot than the gleaming polished concrete downstairs. You can pay less now, but soon get more. Sansom also outlined expansion plans, some visibly under way, others still under (plastic) wraps. A members’ cafe. More classrooms. An expanded shop for metalworkers, to match the new woodshop. A brand new sculpture room. And new, better bathrooms are promised, forgoing the, um, old college radio station aesthetic. Public transportation from brownstone Brooklyn is not easy and involves a lot of walking, especially a problem if you are carrying materials for your project. The immediate neighborhood is not warm and cozy or even industrially chic. Across the street behind sagging fences, it looks a bit bombed out. 3rd Ward will, however, continue to be bike friendly, and incredibly diverse in membership. 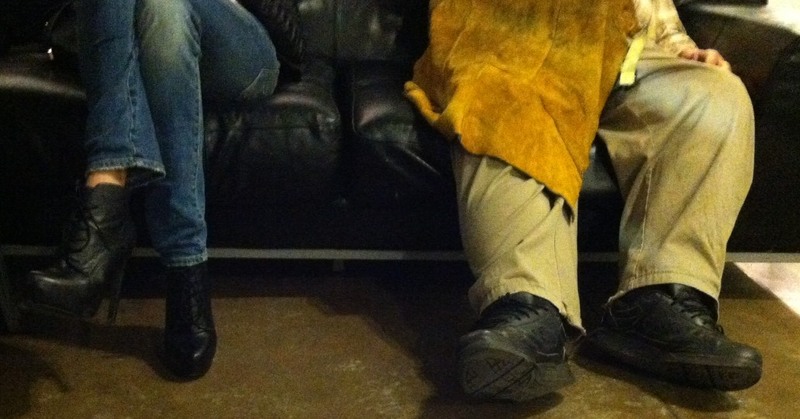 A TALE OF TWO FOOTSORES; Or, The Model and the Metalworker: She is there in 4-inch heels for a photoshoot. He has been working all day with an oxy acetylene torch.